← Lightning Strikes – Can we prevent it? One of the factors that lit the fire under me to update my old website with New Patients Inc was so that I could add some advanced features. One of them was online scheduling for patients. This is a concept that scares the crap out of some dentists, because they think they will be turning their schedules over to strangers. This is not the case (at least in the case of NPI’s Concierge™). I’ve discovered those fears are unfounded. Read on! 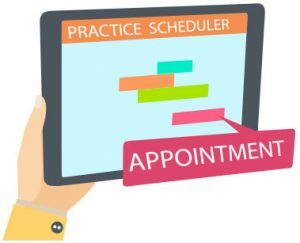 What do you mean by online dental appointment scheduling? To be clear, when I’m talking about online scheduling, this is NOT an “appointment request,” like we see on so many websites, including my previous website. An Appointment Request is an email form the visitor fills out with his / her appointment PREFERENCES, which is then sent to the office. Then the office must contact the prospective patient to finalize an appointment time. In my experience, the attempt to contact the patient often resulted in an unanswered voicemail or email. We’d contact them and leave a message, but many of them never followed up. In the end… no appointment made. Lead lost. I’m talking about patients being able to schedule an ACTUAL appointment on a specific date at a specific time. Online scheduling button on my website. See blue arrows (added). When you add Concierge online scheduling, you will have a widget (a “schedule now” button) on every page of your website. 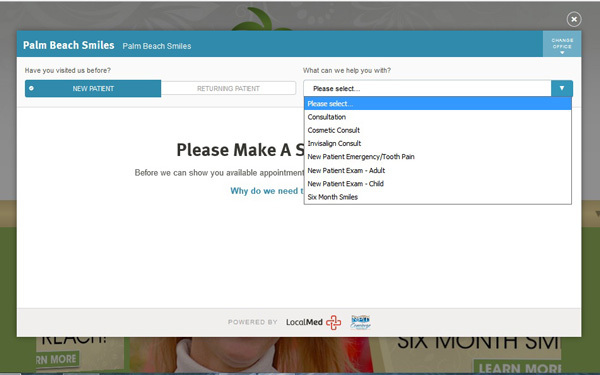 The Concierge widget is NOT an email form for patients and prospective patients requesting an appointment. With Concierge, the patient is making an ACTUAL appointment, at ANY time, without having to play phone tag or email tag with the office. That means if the prospective patient is up with a toothache at 1:30am and hops on Google to find a dentist, that new patient can make an actual appointment for the next morning. What kind of edge does that give you over the other dentists? 😎 Think about it! When would (now) be a good time? With Concierge online scheduling, visitors to your website can make an appointment while they’re “hot” to do it. There’s no waiting for a convenient opportunity to call the office or wait for a call from the office to get things set up. It’s done… right there… RIGHT NOW. 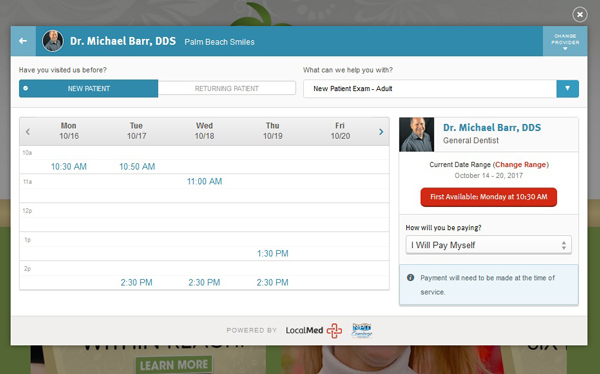 Through the Concierge widget on your website, a patient can choose an actual appointment time shown as available. Concierge accesses your schedule via your Practice Management Software (PMS). For some reason, this scares a lot of dentists. “They have access to my schedule?!? !” Yep. Well, sorta. They have access ONLY to open slots. You can even limit those, if you want (but why would you?). What is the real downside to that? Think about it. The answer: none. It sounds scary, but there’s no real basis for that fear. You can control what days and times show as available, and you can control which kinds of appointments can be made. You have total control. When the website visitor clicks on the Online Scheduling button, this window pops up. 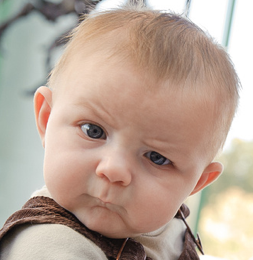 The patient then selects either “New Patient” or “Returning Patient” and then selects which type of appointment is needed. After the patient selects the type of appointment desired, this is the next window. He or she can then either click on the first available appointment (in the red box on the right) or select a time from the schedule on the left. Once that is done, the next pop-up is where the patient finalizes the details of the appointment and confirms it. This form scrolls down, so I’ve created a 3-image composite of the entire pop-up form. The appointment is finalized here. These three images are a composite of what the patient sees as he or she scrolls down. At the end, there is a box where the patient can post a message about the nature of their urgent issue. The patient will also get a confirmation email and text with a confirmation link. The key benefit is that the appointment gets scheduled. The appointment is entered into your PMS. It’s there! Done and done! The commitment is made right when the patient is most enthusiastic about making an appointment. “Strike while the iron is hot,” as they say. When an online appointment is made, you will be notified by email. So, even after hours, you’ll know when appointments are made. I recommend following up with the patients to introduce yourself and let them know you’re looking forward to meeting them. 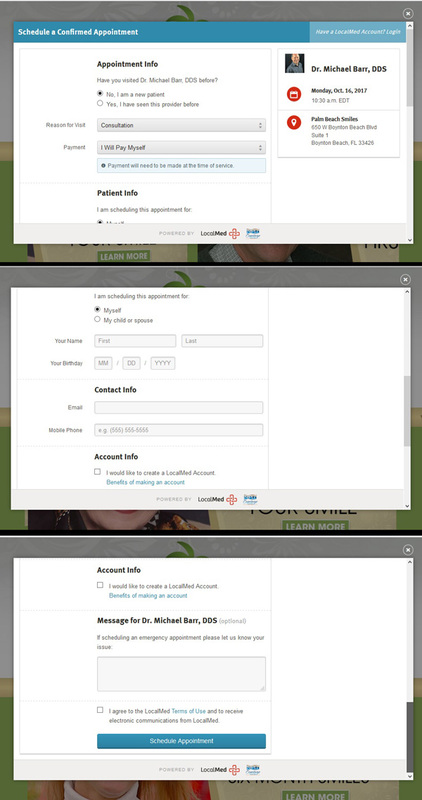 You can also take the opportunity to remind them to download and fill out new patient forms. You can do this by phone, of course. But, if an appointment is made on the weekend, for example, you could send the new patient a personal email welcoming him or her to the practice and ask if he or she has any questions. It’s a nice personal touch. A couple of weeks ago, a new patient scheduled a consultation via the Concierge widget on my website. 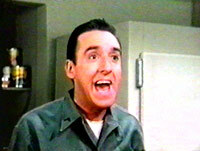 He was interested in a cosmetic makeover with veneers. He had researched several dentists online and had multiple consultations. To make the story short, he chose me, and we’re prepping for 8 veneers next week. Booya! I was as skeptical as any dentist would be and moved forward with Concierge with some trepidation. In the end, the outcome has been completely positive with zero negatives. Folks, this is truly a no-brainer. Bear in mind this isn’t just for new patients. Existing patients can schedule their recalls and emergencies, too. As you have likely surmised, it’s not intended for patients to schedule root canals and crowns. In the few months that I’ve been using Concierge, I have found that patients are more likely to show up than those who called. I can’t explain why. Perhaps, it’s that the appointment was made when they were most committed and enthusiastic about it. This brings to mind the importance of having a great website with compelling content. Today’s reality is that people expect this kind of convenience with everything they do. We’ve been doing it for airline reservations for years. Hotels and car rentals, too. More recently, restaurants are doing online reservations. It works! And, it’s convenient to have the ability to make those reservations 24 / 7… not just during business hours. It is time for dentistry to take advantage of this technology. I hate to use a cliché, but if you don’t do it, you’re missing out! Of course, it will take the profession at large many years to adopt this concept. That’s just the way we roll. But, the sooner you catch this wave, the sooner you’ll reap the benefits! Concierge works with all the major PMS software. You can learn more by clicking on New Patients Inc Concierge online scheduling. This entry was posted in Dental Product Reviews, Practice Management, Technology and tagged New Patients Inc., NPI Concierge, NPI Concierge review, online dental patient scheduling. Bookmark the permalink.